Tier.net Review 2019: Is Tier.net a Good Hosting? Established in 2013, Tier.Net has grown to become a force to be reckoned with in the hosting business in the United States. The vendor provides competitively-priced solutions powered by its powerful and secure data centers, its network infrastructure that uses state-of-the-art redundancy protocols, and an expert team that ensures everything runs smoothly every minute of every day. Tier.Net is a U.S.-based website hosting vendor established in 2013 to provide hosting solutions to individuals and businesses. Tier.Net gives users web hosting solutions that can stand the test of time. The hosting vendor’s support center is located in Florida and has its offices in New York. Data centers are located in several states across the U.S. Its hosting solutions are available for business enterprises of all shapes and sizes. Network security and blazing speed – Tier.Net delivers reliable and fast hosting solutions powered by its powerful and secure data centers, its network infrastructure that uses state-of-the-art redundancy protocols, and an expert team that ensures everything runs smoothly every minute of every day. Custom build – Tier.Net offers custom builds, especially for sophisticated websites that require lots of storage, bandwidth, and high-powered support. Compared to other hosting vendors, Tier.Net is relatively expensive. But of course, if you pay for longer term hosting solutions via Tier.Net, the price will drop. However, given the myriad of features included in the hosting packages, I can say that it is worth the price tag. In addition, its price freeze guarantee ensures that you can rest easy in the knowledge that the company won’t arbitrarily hike the charges at some point in the future. Its 30-day money-back guarantee is the surest way for anyone considering its hosting solutions to try them out before making a permanent decision. Tier.Net has a responsive support team available 24/7 all year round. You can reach someone from this support team via social media, email, live chat, phone, or via its ticketing system. Tier.Net claims to have industry-leading customer support services helping users navigate any hosting challenge effectively and fast. That said, the absence of a knowledge base on its website can be frustrating to users who prefer doing it themselves. I could also not find Tier.Net FAQ section on its website. I was satisfied with the conversation I had with the company’s support team via the website’s live chat. The person I spoke to was patient, polite, and came across as extremely capable. Tier.Net owns all its data centers, thus can with utmost confidence give its clients in the U.S., U.K., India, China, and beyond high availability guarantee. It uses modern hardware and state-of-the-art redundancy protocols to provide lasting hosting solutions to businesses of all sizes. 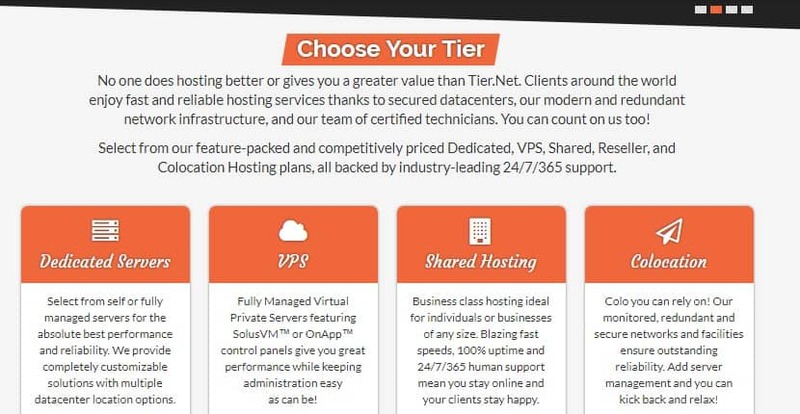 Wondering how Tier.net stacks up against other Web Hosting companies? Enter any other Web Hosting company and we will give you a side-by-side comparison.